The Western Conifer Seed Bug Leptoglossus occidentalis is a large Squashbug (Coreidae) of North American origin and regarded as being a serious pest of Pines, with Scot's Pine (Pinus sylvestris) and Douglas Fir (Pseudotsuga menziesii) being particularly prone to attack. The speed of its range increase across the continent has been quite staggering, yet is similar to other invasive invertebrates that have reached the UK in recent years, such as both the Harlequin Ladybird (Harmonia axyridis) and the Horse Chestnut Leaf Miner (Cameraria ohridella). 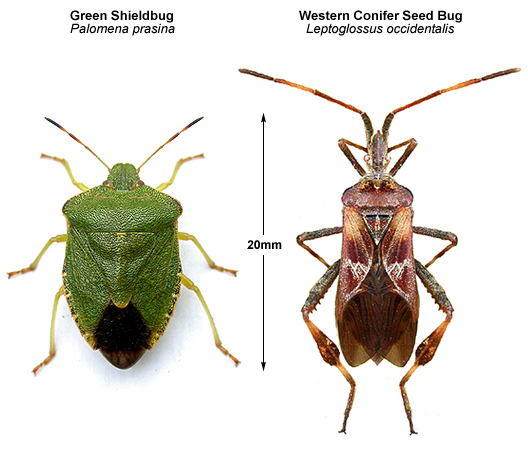 Following its introduction into northern Italy in 1999, Leptoglossus occidentalis spread northwards and reached Switzerland in 2002, followed by Spain and Slovenia in 2003, Croatia and Hungary in 2004, Austria in 2005, Germany, France, Serbia and the Czech Republic in 2006, the UK, Belgium and Slovakia in 2007 and Montenegro and Poland in 2008. Leptoglossus occidentalis is an excellent flyer and all of the UK's early records are believed to have been as a result of genuine migration - arriving here in the Autumn under their own steam, rather than being ship-assisted to our shores. Most of the UK's early records came (and presumably still do to a large extent) from MV moth traps operated at south coastal locations between September and November. Because of the potential threat to the Pine growing industry, DEFRA and the Forestry Commission were concerned about its arrival here in 2007 and the possibility of further records. Running a MV moth trap is certainly one of the most likely ways of seeing one, but their large size means that they are often noticed by the public and they frequently occur indoors during the late Summer and Autumn when searching for somewhere to over-winter. A specimen found indoors at a school in Weymouth, Dorset in 2007, was the UK's first known record. There were further records following a large influx into the UK during the latter part of 2008, including a number of inland records - the most northerly being at Kendal in Cumbria (Petley-Jones, R.). Nearer to Nottinghamshire, there were records from Quorn in Leicestershire (Gamble, P.) and Charlesworth in Derbyshire (recorder unknown) the same year. Nottinghamshire's first record didn't come until a year later, when one was found on the bedroom curtains of David and Moira Worthington's house at Eakring on September 27th 2009. Moira was quick to email a picture to us for identification and thankfully had retained the specimen which we immediately went round to collect and photograph. As of January 2018, there have now been 25 records of Leptoglossus occidentalis in Nottinghamshire, with most records coming from urban and suburban areas of the city. In fact, when looking at the interactive distribution map on the NBN Gateway, it is noticeable that most Nottinghamshire, Derbyshire and Leicestershire records are from urban locations, with few records from the more rural areas of all three counties. This may be down to lower levels of human habitation away from our towns and cities, meaning fewer people actually see them. Away from the city of Nottingham and its out-lying suburban areas, all the other Nottinghamshire records (in addition to the Eakring record) are very much isolated occurrences including single records from Forest Town in Mansfield, Balderton in Newark and at Rampton. It is perhaps surprising, there is just one record from the Mansfield area and still none at all from the towns of Worksop and Retford, when there are many records from further north in the UK. 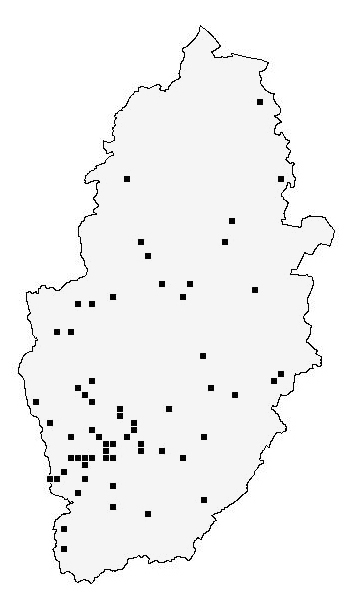 Most of Nottinghamshire's 54 known records have occurred during the Autumn, when there is obviously a genuine migratory movement, or adult dispersal prior to over-wintering. The last week of September and the first week of October, provide a clear peak in the county's known records at the time of writing (December 2018). Since 2015, there has been an increasing trend for late Winter and early Spring records, so adults must be over-wintering here quite successfully.